This Chicago based VoIP provider specializes in providing small businesses with quality and cost efficient VoIP service and phone systems. With an extensive carrier network and high tier Cisco phones, the provider delivers over 30 quality service features including Intercom, 4-Digit Dial, Unified Network, Voicemail to Email, Virtual Fax, Call Queuing, Hunt Group, Auto Attendant, Toll Free Number, Direct Inward Dial (DID), Call Forwarding, Call Transferring, Caller ID, Heads-Up-Display (HUD), Virtual Number, and more. Aside from service, Chicago Business VoIP (CBV) also offers a wide variety of VoIP phones. In doing so, CBV is able to offer bundles which include a Phone System, Phone Lines, and Fax. 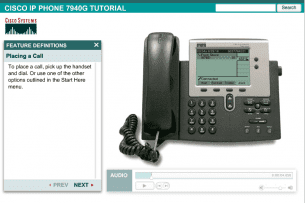 With this bundle, users pay a onetime fee of $150, which covers the cost of the Cisco phone, and $49.99 per line, per month (plus tax and shipping). If internet ever goes down, CBV has redundancies that allow users to still make calls—i.e. Emergency forward to number, Find Me/Follow Me, and Smart-phone (plug Cisco phone into any source of internet). CBV does not require users to enter into a contract. Additionally, there are no minimum usage commitments. In employing cost efficiency, the provider also has a fixed cost per month, doesn’t require additional infrastructure (works off preexisting internet connection), and has a unified network—which can help cut down on inter-office and out of network calling charges. Along with feature and cost, CBV features support resources for users including FAQs, Testimonials, a Benefits list, Hosted VoIP feature list, a Web portal, and a Fax Portal. Also, for customer support users can call the provider at anytime, or fill out a web form directly on the website (recommended). What Do You Think of Chicago Business VoIP?